Background Healthcare is approaching a tipping point as burnout and dissatisfaction with work-life integration (WLI) in healthcare workers continue to increase. A scale evaluating common behaviours as actionable examples of WLI was introduced to measure work-life balance. Objectives (1) Explore differences in WLI behaviours by role, specialty and other respondent demographics in a large healthcare system. (2) Evaluate the psychometric properties of the work-life climate scale, and the extent to which it acts like a climate, or group-level norm when used at the work setting level. (3) Explore associations between work-life climate and other healthcare climates including teamwork, safety and burnout. Methods Cross-sectional survey study completed in 2016 of US healthcare workers within a large academic healthcare system. Results 10 627 of 13 040 eligible healthcare workers across 440 work settings within seven entities of a large healthcare system (81% response rate) completed the routine safety culture survey. The overall work-life climate scale internal consistency was α=0.830. WLI varied significantly among healthcare worker role, length of time in specialty and work setting. Random effects analyses of variance for the work-life climate scale revealed significant between-work setting and within-work setting variance and intraclass correlations reflected clustering at the work setting level. T-tests of top versus bottom WLI quartile work settings revealed that positive work-life climate was associated with better teamwork and safety climates, as well as lower personal burnout and burnout climate (p<0.001). Conclusion Problems with WLI are common in healthcare workers and differ significantly based on position and time in specialty. Although typically thought of as an individual difference variable, WLI appears to operate as a climate, and is consistently associated with better safety culture norms. We introduced a work-life climate scale that assesses frequency of behaviours such as skipping meals, taking breaks and changing personal plans for work.1 Focusing on behavioural frequency circumvents limitations of scales emphasising satisfaction with work-family balance or work-family conflict.10 Historically, researchers have used a single item to evaluate WLI: ‘My work schedule leaves me enough time for personal/family life.’2 8 Assessing multiple behaviours expands this concept to more objective components in an effort to make WLI assessments more diagnostic and actionable for targeted interventions. To meet Joint Commission requirements regarding safety culture assessment, many US hospitals measure teamwork climate (consensus of interpersonal relationship norms) and safety climate (shared perceptions of patient safety norms and quality measures in a given work setting).11 12 Published studies link safety and teamwork climate to clinical and operational outcomes including hospital-acquired conditions, surgical complications and mortality.13–18 Similarly, burnout is a variable of growing interest, linked to a broad array of outcomes19 20 and included in routine safety culture surveys. Burnout, defined as a syndrome of emotional exhaustion, loss of meaning in work, feelings of ineffectiveness and the tendency to view people as objects,2 21 impacts both quality of care provided and quality of the healthcare delivery system.9 22–24 Prolonged work-life imbalance is thought to contribute to burnout, as practising healthcare workers often report both professional burnout and dissatisfaction with WLI.2 25–27 Given the association between WLI and burnout, we surmise that WLI is also associated with outcomes. Healthcare workers report comfort in tending to non-work needs only when cultural norms, supervisors and coworkers also demonstrate a commitment to WLI.28 Building on prior work,1 this study used recent culture survey results from a large healthcare system to further validate and test relationships with the work-life climate scale. We hypothesised that work settings reporting better work-life climate would have better safety culture norms. Therefore, the aims of this study were: (1) to explore differences in WLI behaviours by role, length of time in specialty and other demographics in a large healthcare system; (2) to evaluate the psychometric properties of the work-life climate scale and the extent to which it acts like a climate, or group-level norm, when aggregated at the work setting level; and (3) to explore associations between work-life climate and other domains including teamwork, safety and burnout. This is a cross-sectional study of electronic survey data collected in May 2016 from 10 627 healthcare workers across 440 work settings within seven entities of a large academic health system on the east coast of the USA. Work settings included intensive care units, inpatient units, outpatient clinics, pharmacies, clinical labs, and home care and hospice groups. All staff with 50% or greater full-time equivalent commitment to a specific work setting for at least four consecutive weeks were asked to participate. Work settings with five or more respondents and a response rate of at least 40% were included in analyses, resulting in a sample of 396 work settings (90%). Safety, Communication, Operational Reliability and Engagement (SCORE) survey29 is a validated measure of work setting norms regarding teamwork climate, safety climate,29–32 local leadership, improvement readiness, personal burnout (emotional exhaustion)18 and burnout climate (exhaustion climate).1 18 32 Improvement readiness is the extent to which quality improvement is supported within a work setting, and local leadership is the extent to which leaders communicate with and are available to healthcare workers.29 Subscales are evaluated using a Likert scale. A copy of the SCORE survey is available at http://www.dukepatientsafetycenter.com/doc/SCORE_Techincal_Report_5.22.17.pdf (pp 12–14 of the pdf). Climate is assessed by aggregating collectively shared attitudes, behaviours or perceptions that characterise the norms of a work setting.33 Using a statistical test for clustering of results, we examined respondents at the work setting level to assess the nature of WLI norms as a climate. Ate a poorly balanced meal. Worked through a day/shift without any breaks. Arrived home late from work. Slept less than 5 hours in a night. Changed personal/family plans because of work. Allowed responses include: rarely or none of the time (less than 1 day); some or a little of the time (1–2 days); occasionally or a moderate amount of time (3–4 days); all of the time (5–7 days); and not applicable. Not applicable responses were excluded from analysis. The scale may be scored in two ways depending on the level of analysis: (1) an individual difference measure, where means were calculated of the eight items for each respondent, such that higher scores reflect worse WLI; and (2) assessing WLI at the work setting level (ie, local WLI norms), using a previously published technique1 that computes the percentage of respondents within each work setting with a mean score ≤2 (averaging 2 days or less per week of poor WLI). Aggregated scores are described as ‘percentage positive’ or ‘percentage reporting good work-life climate’, reflecting better WLI. Across all analyses, cases with missing data (0.8%–3.3%) were excluded and all hypothesis tests were two tailed. Frequencies and means (±SD) describe respondent characteristics. Cronbach’s alphas assessed internal reliability and random effects analyses of variance (REANOVA) partitioned the scale and item variance into within-work versus between-work setting components. Intraclass correlations (ICC) assessed the proportion of the total variance in the WLI scale accounted for by clustering at the work setting level and to determine whether work setting level analyses were warranted. ANOVAs tested for differences on the work-life climate scale score by respondent characteristics. Differences between WLI quartiles were tested with independent sample t-tests. Spearman correlations examined associations between work-life climate items and the safety culture domain scale scores. All statistical analyses were performed using IBM SPSS V.24. 10 627 of 13 040 surveys were returned (overall response rate 81%). Table 1 presents demographic data for respondents. Work-life climate internal consistency was α=0.83 (table 1). Spearman correlations among the eight items ranged from r=0.21 to r=0.60, p<0.001. Variance for the work-life climate scale and all its items were statistically significant for both between-work settings and within-work settings (all p<0.001). The work settings’ ICC for overall work-life climate was 0.09, and items’ ICCs ranged from 0.045 to 0.107. Clustering was reflected in these results as 9% of total variability in work-life climate scores was due to between-work setting differences and 4.5%–10.7% of the total variability in the WLI items was due to between-work setting differences. At the entity level the ICC was lower at 0.04. Previous research suggests values of 5% reflect small to medium group membership effect.29 34 Our results of 9% reflect a non-trivial degree of clustering, suggesting WLI operates like a climate and supports work setting level aggregation. Univariate ANOVAs demonstrated significant differences in work-life climate scale between healthcare worker roles (F(1, 17)=25.36, p<0.001) and work settings (F(1, 396)=3.25, p<0.001). Figure 1 demonstrates the percent reporting good work-life climate (performing specific behaviours 2 days/week or less) by healthcare worker role, by the 396 work settings, by years in specialty and by shift type and length. Among healthcare worker roles, physicians of all stages (residents, fellows and attending physicians) most frequently reported engaging in poor WLI behaviours. Good work-life climate or percent positive is defined by those who reported performing the specific poor work-life balance (WLB) behaviours 1–2 days/week or less than 1 day/week. Graph (A) shows the percentage of respondents reporting good work-life climate by each clinical work setting. Graph (B) shows percentage of respondents reporting good work-life integration (WLI) by healthcare worker role. Graph (C) shows the percentage of respondents reporting good WLI by length of time in specialty and shift type and length. Work-life climate scale differed significantly by years in specialty (F(1, 6)=8.05, p<0.001). A post hoc Scheffé test indicated that individuals with less than 6 months in their respective specialty (M=1.72, SD=0.58) had significantly better WLI scores compared with all other categories of experience in specialty (p<0.001). All other categories of years in specialty did not significantly differ (6–11 months M=1.96, SD=0.65; 1–2 years M=1.92, SD=0.67; 3–4 years M=1.95, SD=0.70; 5–10 years M=1.96, SD=0.70; 11–20 years M=1.96, SD=0.71; 21 or more years M=1.95, SD=0.70). Work-life climate scale also differed by shift (F(1, 3)=53.98, p<0.001). A post hoc Scheffé test indicated that individuals who worked day shifts (M=1.89, SD=0.67) had significantly better WLI scores compared with all other categories of shifts (p<0.001). Healthcare workers who identified their shift type as ‘other’ reported the poorest WLI scores (M=2.16, SD=0.74). Night shift (M=2.00, SD=0.73) and swing shift (M=2.03, SD=0.68) were not statistically different from one another. Work-life climate scale also differed by shift length (F(1, 4)=89.39, p<0.001). A post hoc Scheffé test indicated healthcare workers reporting 8-hour shifts had significantly better WLI scores (M=1.80, SD=0.65) compared with all other shift lengths (p<0.001). No statistical difference was noted between 10-hour shifts (M=1.96, SD=0.69), 12-hour shifts (M=2.02, SD=0.70) or flex shifts (M=2.07, SD=0.74). The poorest WLI scores were reported by those whose shift length was ‘other’ (M=2.20, SD=0.73) but this score was not statistically different from flex shifts (M=2.07, SD=0.74). Correlation matrixes for work-life climate and the eight WLI behaviours, with additional healthcare climates surveyed, are presented in tables 2 and 3. Cronbach’s alpha calculations are included in the diagonal of table 2 to account for internal consistency of each domain. The mean aggregated work-life climate scale score across the 396 work settings was M=64.55, SD=17.27 (higher scores favourable), ranging from 0% to 100% of respondents within work settings reporting positive work-life climate. Bottom quartile work-life climate scale scores ranged from 0 to 52.9, M=41.48, SD=10.18. Top quartile scores ranged from 75.5 to 100, M=85.20, SD=7.43 (table 4). Top and bottom quartile work-life climate scores were associated with significant differences in all SCORE scales assessed (p<0.001). Figure 2 demonstrates the relationships between work-life climate quartiles and SCORE safety culture scales, including t-test comparisons of the first and fourth quartiles. 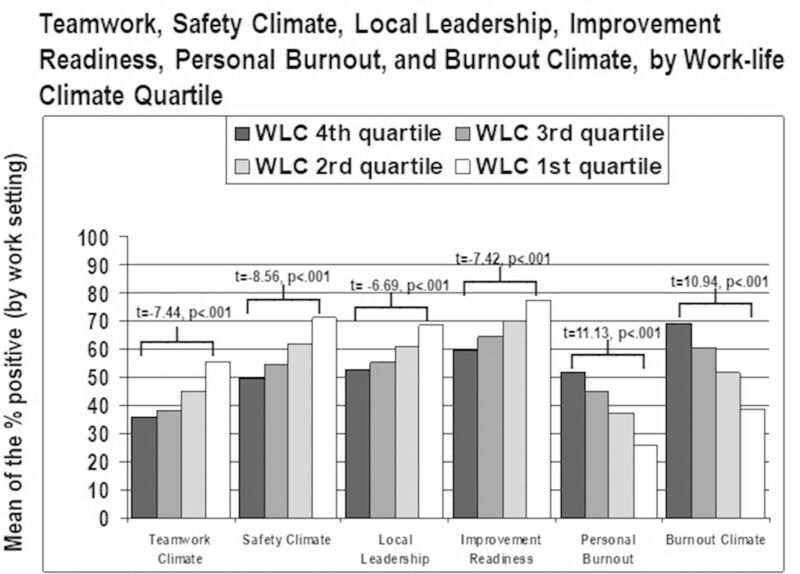 Differences between teamwork climate, safety climate, burnout, personal burnout, local leadership and improvement readiness between work settings divided into work-life climate (WLC) quartiles. Each bar is the mean of the percent positive responses for each work setting within a quartile. In this large and diverse assessment of work-life climate, we found robust, consistent group-level differences and clustering of work-life climate behaviours at the work setting level. Work-life climate varied widely by role and work setting. 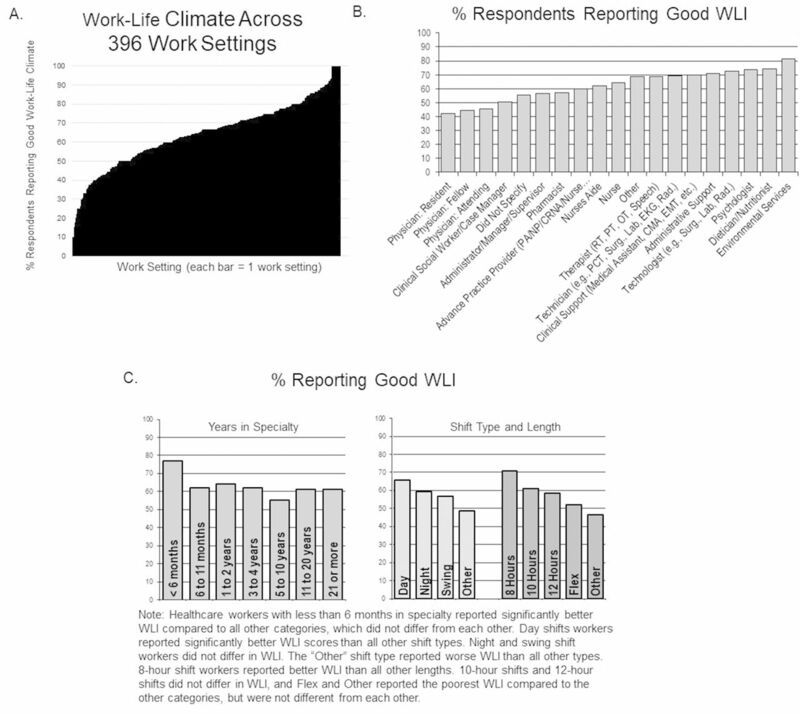 REANOVAs and ICCs demonstrated a non-trivial degree of consistency within work settings compared with between-work settings, signalling that WLI operates as a work setting-level climate. This is a new finding, as WLI is typically thought of as an individual differences variable rather than a group norm. ICC results indicate that an individual’s response to a work-life climate item is predictive of the response from another random member of that same work setting. The work-life climate items were designed as individual differences behaviour. This clustering of work-life climate, to our knowledge, has not been reported elsewhere. The central theme evaluated in the work-life climate scale revolves around a respondent’s ability to maintain appropriate separation between personal life and work. The moderate shared variance between items is consistent with previous research1 and indicates that an infraction of one personal boundary is often accompanied by an inability to maintain boundaries in other WLI items. Given the association between work-life climate and all other measured SCORE scales, it is important to consider work-life climate in safety culture assessments. Work-life climate had the strongest associations with burnout climate and personal burnout. Personal burnout assesses whether an individual reports signs of emotional exhaustion, while burnout climate assesses whether respondents see signs of emotional exhaustion in their work setting colleagues. Poor WLI was associated with healthcare workers reporting more emotional exhaustion. This association provides concrete WLI behaviours that may breed burnout. Burnout has implications for patients, the individual healthcare worker and their families,2 5 35 and is linked to lower perceptions of safety culture,18 increased medical errors22 and lower quality care.36–38 Targeting WLI behaviours may provide tangible interventions at the work setting level that reduce burnout. Intervention trials are needed to evaluate this concept and additional research should address the question of which comes first: burnout or poor WLI. In healthcare, barriers to WLI are deeply rooted within the professional culture.39 Despite an understanding that work-life imbalance negatively affects providers’ well-being, healthcare workers are heralded for pushing the limits of WLI. The misconception that unhealthy WLI is better for patient care is often ingrained in those entrenched in the field, yet the results from this study directly contradict this idea, suggesting that poor WLI is a patient safety risk. These results provide strong and consistent support that healthcare workers report safety culture norms are worse in work settings where WLI norms are worse. Burnout and job dissatisfaction among healthcare workers are increasing.1 2 8 18 25 35 40–43 Despite growing concern, limited validated methods exist for measuring WLI in healthcare.6 8 9 40 Assessing work-life climate using behavioural frequencies allows for brief, specific, diagnostic, replicable and actionable quantification of WLI.1 This study reinforces that the work-life climate scale is a reliable metric exhibiting strong psychometric properties. As with our previous work, the scale elicits results that vary by work setting, discriminates between positive and negative workplace norms and aligns with other culture constructs that correlate with clinical and organisational outcomes. Across all healthcare workers, years of experience in their specialty is significantly linked with WLI behaviours. Healthcare workers with less than 6 months of experience reported significantly better WLI behaviours. After 6 months, poor WLI was more common and remained more common. Rather than experience improving efficiency and health norms guiding new workers to navigate a career, it appears new healthcare workers adopt the unhealthy patterns of work-life behaviours surrounding them. Given the clustering identified through ICCs, it is understandable that healthcare workers are more likely to demonstrate a commitment to WLI if this is a cultural norm supported by leaders and coworkers.28 In addition to using WLI at the individual level, we recommend future research consider group-level contexts where WLI resembles group norms. Perhaps, wellness is more of a group-level norm than previously expected. Work-life climate was associated with all six work setting norms assessed. Quartile analyses revealed higher work-life climate scores were associated with better teamwork and patient safety norms, better leadership, increased readiness for quality improvement and lower burnout in oneself and one’s colleagues (figure 2). Statistically significant differences were seen comparing the best work-life quartiles to the poorest work-life quartiles in all safety culture constructs (table 4). Specifically, those work settings in which people eat poorly, change personal/family plans for work and skip breaks are the same work settings with deficits in patient safety and communication breakdowns. It is feasible that an appropriate work-life climate supported by leaders promotes healthcare workers who are more engaged in the work setting, adaptable to changing team dynamics, appropriately resolve conflicts and proactively promote safety at work. Correlations of the eight work-life behaviours and scaled scores for other climates revealed that changing personal or family plans for work had the highest correlation to other safety culture domains, with the strongest association with personal burnout and burnout climate (table 3). The strongest linkage to both teamwork and safety climate involved sleep. It is understandable that when healthcare workers are not well rested, they are less likely to receive input from others and support others in their work setting. Consistent with previous research, the link between work-life climate, teamwork climate and safety climate offers a new opportunity through which leaders may target to improve healthcare quality,1 and justifies the inclusion of work-life climate in assessments of safety culture. Healthcare is approaching a tipping point as professional burnout and dissatisfaction with WLI worsen.2 Despite the prevalence of poor WLI, little evidence exists on how to effectively address this problem. Given the unpredictable nature of healthcare, organisational leaders must establish strategies to facilitate WLI.2 46 47 Assessing work-life climate using behavioural frequencies equips leaders with concrete ways to monitor and improve this climate. While it is not yet clear that normalising healthy WLI results in better work-life climate, WLI interventions targeted at the work setting level (vs to individuals) may be maximally beneficial. This study has several limitations. Self-reported data may be biased or inaccurate; however, our robust response rate mitigates potential sampling bias. The study’s cross-sectional design limits generalisability and causal effects when interpreting the relationship between WLI behaviours and other safety domains. Yet the clear association demonstrates a potential new focus on WLI for initiatives to improve healthcare quality. Future research should evaluate this work-life climate over time, including responsiveness to interventions and longitudinal associations with other healthcare climates. The extent to which WLI climate is influenced by social contagion or shared work demands within work settings also warrants further consideration. While other climates in healthcare have been linked to specific patient outcomes, the direct link to work-life climate has not yet been established and offers an additional focus for study. In this study, the threshold for good work-life climate was set using previously published literature.1 Additional study could define a different threshold for good work-life climate based on outcomes for healthcare workers, patients or specific safety culture changes. The work-life climate scale is a reliable tool to evaluate WLI in healthcare workers across a variety of work settings. It is associated with other safety culture domains, opening the door for initiatives to improve teamwork, safety and burnout by targeting specific WLI behaviours. We believe work-life climate is associated with these diverse norms because it is fundamental to many aspects of healthcare. Poor WLI and burnout are a pandemic affecting a significant portion of the workforce. Improving this climate should be a strategic priority for leaders interested in building capacity and resilience in their workforce. Improving WLI is likely to improve healthcare worker’s quality of life, organisational outcomes and, ultimately, quality of care for patients.
. Behaviors that undermine a culture of safety. Sentinel Event Alert 2008;40:1–3.
. Preoperative safety briefing project. Perm J 2004;8:21–7.
. Principles to promote physician satisfaction and work-life balance. Minn Med 2008;91:41–3. Contributors SPS performed the literature search, was involved in data analysis, made the first draft of the manuscript and was involved in all critical revisions of the manuscript. KCA performed the statistical analysis, was involved with manuscript preparation, and all revisions of the manuscript. JB, KJR, TDS and JP were involved with manuscript preparation and revisions. JBS conceived the study and design, was involved in data analysis, statistical analysis, manuscript preparation and all critical revisions. All authors approved the final manuscript. Competing interests SCORE is available at no cost for research and quality improvement purposes. The Duke Patient Safety Center has a research contract with Safe & Reliable Healthcare to conduct secondary analysis on Safety Culture data. Safe & Reliable Healthcare uses the work-life climate scale in their online platform. TDS is coinventor of the Physician Well-Being Index, Medical Student Well-Being Index, Nurse Well-Being Index and Well-Being Index. Mayo Clinic holds the copyright for this instrument and has licensed it for use outside of Mayo Clinic. TDS receives a portion of any royalties paid to Mayo Clinic. TDS has received honorarium for presenting grand rounds, keynote lectures and advising on the topic of physician well-being. JBS and JP have funding through the NIH through a WISER R01 grant (R01 HD084679-01) to study burnout in healthcare. KCA and JBS have received honorarium for talks in which they discuss WLI and burnout. Ethics approval IRB at Duke University deemed exempt from review (IRB number: Pro00083427).